Our STEAM Showcase was amazing! Thirty-one teams of 5th-8th graders competed, and it was wonderful to see the innovative, creative and effective projects. All projects encompassed science, technology, engineering, art and math. Thank you to Ms. Spooner, our judges and teachers for grading our presentations. Spring Enrichment is now open. Spring Enrichment After School Enrichment Schedule Spring 2019! Oh what a fun Math & Literacy Night! Our Preschool-2nd graders and their parents had a great time playing games in the gym, all while focusing on different math and reading concepts. They even earned prizes! Thank you to our teachers and Ms. Youkhana! 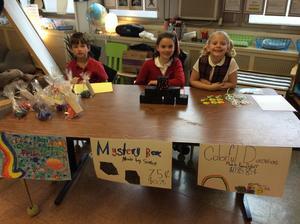 Ms. LeCompte's Second Graders hosted Market Day -- and it was a tremendous success! The students made items at home, then brought them into school to display and sell, even creating signage and advertising. At the end of the day, they counted their profits, totaling $169.09 which was donated to Feed My Starving Children. Our March Prayer Families learned about giving alms to the poor. 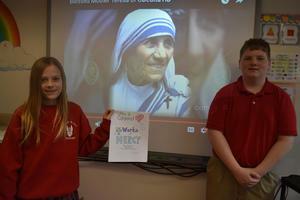 They learned about the life of Mother Teresa and committed to bringing in clothing to share with those in need. 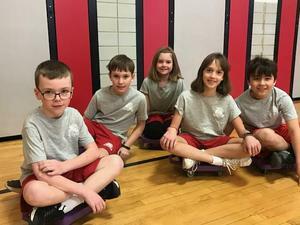 During the month of February, Physical Education Teacher Justin Drexler taught an Adaptive Sports unit, showing students what it would really be like to live life in a wheelchair or vision-impaired. Students even used their non-dominant limbs to experience what it is like to compete with physical challenges. We gathered in the gym this morning and Father Mike Solazzo led us in a very special Palm Burning Ceremony. Father Mike helped prepare us for Ash Wednesday and Lent. Dressed in our coats, hats and gloves, we then went outside for the burning of the palms. Our junior kindergarteners loved having their moms come for muffins! The junior kindergarteners celebrated Moms and Muffins last Friday to culminate letter "M" week. 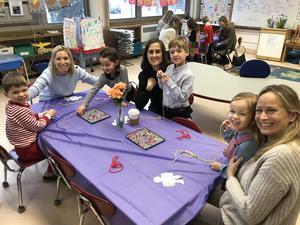 They beaded necklaces together, shared their "Mom Book," sang songs and ate muffins! It was very special to spend our morning with our moms.